Instead of travelling West, akin to the Monkey King’s quest to achieve peace, he went North. The harsh terrain and its unknown dangers will keep him strong. While how he survived crossing the Alpines is not addressed, I soon find on the first few pages he’s leading a simple life. But his training tells him he has to stay mentally and physically sharp. The narrative reveals his inner voice. That rage still wants to consume him much like how the Symbiote controls Eddie Brock (aka Venom). He’s clueless to what lurks deep in the woods. The events here take place before the 2018 God of War game for the PlayStation 4 (released in April of this year) and feels at home to what will eventually happen in the electronic front. His son, Atreus, is safe. Unknowingly, while out in the woods, Kratos killed a beast that he should have left alone. Shades of PIXAR’s Brave are hinted at. Later, upon coming home, a visit from strangers reveals they did not take kindly to Kratos killing a monster. 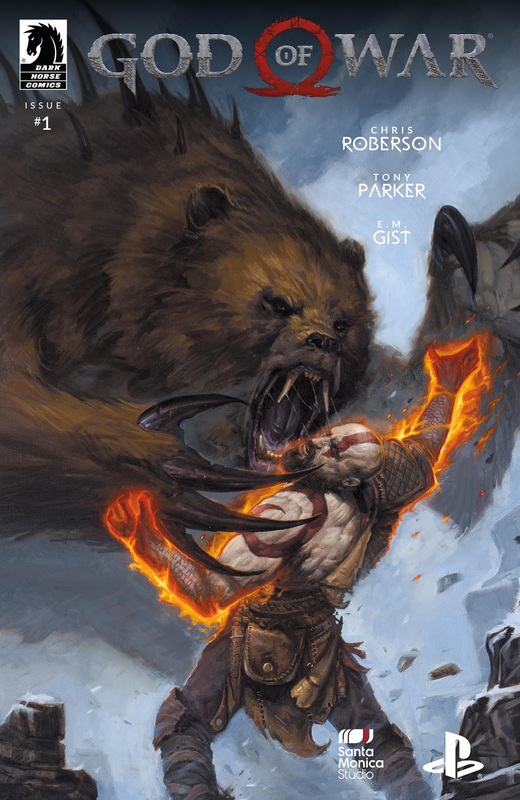 Chris Roberson (co-creator of iZombie; Rasputin: Voice of the Dragon) quickly develops the plot with this first issue and unlike the previous series, is not muddled with many figures to deal with. I particularly enjoyed how the creative team behind this four-issue series decided to have the Norseman speak in their native tongue. For the reader, they are written in runes. A decoder ring is needed to know what they are saying, and fortunately, I know enough of the written language to make out what they are saying. Tony Parker nicely continues the tradition from the games, and that’s to make Kratos look larger than life. This character is holding back, and the stretch marks and emotion put into the design shows he’s not given up being a Spartan yet. While the debut issue works well to tease at the coming dangers both man and boy must face, I am already waiting in bated breath for what issue two will offer. A fight is coming, and by Thor, Odin better be afraid, very afraid. Issue #1 is out today, November 14th, and #2 set for Jan 9th, 2019 release.